USG Boral’s engineering team co-ordinated with Lend Lease Project Management Construction and the consultant team during the design and construction phase to ensure the most economical solutions were adopted to meet project specifications across the 165,000 square metre, seven-level structure. USG Boral Plasterboard state sales manager Glenn Ford observed that the paediatric facility project met all performance and design outcomes as a result of close working relationships, particularly on site. At its peak, the project workforce exceeded 2100 people, making it imperative for them to maintain a physical presence on site, communicate with the client and monitor the quality of work undertaken. Weekly walkthroughs with project managers and contractors were facilitated by USG Boral to assess the quality of wall and ceiling installations, ensure compliance to specifications and also provide advice on technical matters. Custom solutions were provided by USG Boral during the construction of the paediatric facility. Using their expertise in fire, structural and acoustic outcomes, USG Boral's engineering team was able to modify plasterboard systems to suit site conditions. Structural testing was carried out for plasterboard ceilings to accommodate heavy fixtures, helping the purpose built facility house a variety of medical equipment. The engineering team provided continuous technical support to the plasterboard contractors, simplifying the installation of the plasterboard systems. 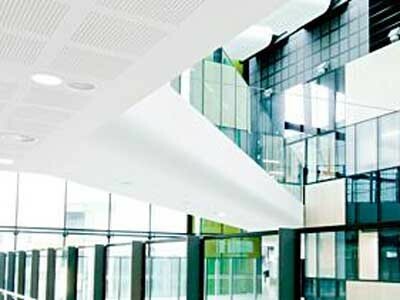 USG Boral’s plasterboard building solutions address a variety of interior applications commonly encountered within hospitals and other healthcare facilities, from fire rated and acoustic systems to impact and radiation protection linings. USG Boral's Fiberock wall lining, an impact resistant product for high traffic areas, was used extensively in the project. Fiberock combines the impact toughness of masonry with the design and installation convenience of plasterboard while also minimising the growth of mould. The complex project also threw up a new challenge for USG Boral, requiring them to develop a new plasterboard product to help the architect achieve acoustic design objectives. However, USG Boral's engineering team was able to quickly develop and produce a new 13.5mm round hole perforated plasterboard for this application. According to Lend Lease Senior Construction Manager Bill Alexandrakis, USG Boral is a preferred supplier and a national alliance partner with a longstanding and successful relationship with Lend Lease. Commenting on the paediatric facility project, he said that USG Boral was involved very early in the procurement, selection and specification process and provided a number of design initiatives that reduced costs and improved on-site production. Mr Alexandrakis observed that USG Boral’s management and technical teams were very pro-active during the execution of the project to ensure quality workmanship while also demonstrating a strong commitment to ESD principles and Lend Lease’s Green Star accreditation. He added that USG Boral also participated in design reviews and assisted the project consultant team to specify wall systems that met the brief and the acoustic criteria of the project. Lend Lease was extremely appreciative of USG Boral’s service throughout the four-year project as well as the technical advantages and innovative design systems provided to help the construction company achieve their project milestones.